When the Asus ROG Zephyrus GX501 dropped last year, we suspected it would be the end-all and be-all for gaming laptops. That is, until we saw the price tag. Although it was a spectacle to behold – gorgeous and thin without compromising on power – the first notebook to leverage Nvidia’s Max-Q technology was out of reach for most gamers due to its $1,999 (£2,289, AU$3,929) cost of entry. The latest version of the Dell Inspiron 15 7000 Gaming, then, is the antithesis to the Asus ROG Zephyrus GX501. In fact, it’s more comparable to the Razer Blade and the Gigabyte SabrePro 15. However, unlike both of those options, the Inspiron 15 7000 Gaming now holds an Nvidia Max-Q internal design, meaning all of its components have been squeezed into a frame that’s under an inch thick – and that, theoretically, its inventive cooling system will keep them all from catching fire as a result. For an aspiring PC gamer on a budget, the Dell Inspiron 15 7000 Gaming – henceforth known as ‘Inspiron 15 Gaming’ – seems like an obvious choice, as you’ll soon discover from its astonishingly low range of prices. But, for under a grand, is it possible for a laptop to deliver on its promise of true portability matched with the performance necessary to run graphically intensive, triple-A blockbuster titles? Let’s find out. At the time of writing, you can buy the Dell Inspiron 15 7000 Gaming we reviewed for $979 from Dell in the US. That’s a sale tag, down from its $999 manufacturer’s suggested retail price; nevertheless, shelling it out will grant you a version of this laptop which houses a 15.6-inch 1080p display, an Intel Core i5-7300HQ processor, 8GB of RAM, an Nvidia GeForce GTX 1060 graphics in the Max-Q design and 256GB of solid-state drive (SSD) storage. Australian customers can get the same – and the cheapest – model for AU$1,499. In the UK, the situation is a little different. For a Dell Inspiron 15 7000 Gaming featuring a GTX 1060, you’ll need to shell out at least £1,399 for the i7-7700HQ, 16GB of RAM, 256GB SSD and 1TB hard drive disk (HDD) to go with it. That, too, is a sale price, with the original being £1,418. 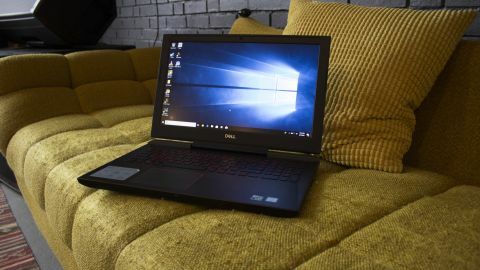 If you would rather have it for a lower cost and with more total storage, the Dell Inspiron 15 7000 Gaming currently starts at $949 in the US (normally $1,099). You’ll be in for the same screen, processor, RAM and graphics as the laptop reviewed here, but with a 128GB SSD and 1TB HDD rather than just 256GB of space. This contrasts nicely with the still-economical, $1,399 (£1,499, AU$2,249) Gigabyte SabrePro 15 and the much more expensive, $1,899 (£1,799, AU$2,799) Razer Blade, though you’re probably wondering what corners were cut for it to get there. The answer is, surprisingly, very few. As far as gaming laptops go, the Dell Inspiron 15 Gaming is relatively subtle in its appearance. Despite its ‘edgy’ red and black color scheme, professionals and students alike can find solace in its toned down looks compared to those in Dell’s Alienware lineup. There’s no sign of a gaudy, extraterrestrial mascot or customizable RGB ‘FX’. Anyone who demands that sort of thing from their laptop ought to turn elsewhere. Instead, the Inspiron 15 Gaming boasts a matte black finish, with option of ‘Beijing Red’ for anyone especially susceptible to the Dell-meets-Spider-Man: Homecoming marketing team-up. Either way, the Inspiron 15 Gaming’s understated style works in its favor. Dell even went as far as making the ventilation look sophisticated and the hinge appear fashionable, an impressive feat considering its dimensions. The Alienware 17 R3 should take a hint from the Inspiron in that regard. Moving onto inputs, the Dell Inspiron 15 Gaming does have a red-backlit keyboard with a full-size numberpad, and one that feels natural to the touch at that. It’s no mechanical rig in terms of travel, but 1.4mm isn’t half bad. Above it is a power button that conveniently doubles as a working fingerprint reader, which we love. The trackpad, on the other hand, reeks of being an afterthought. It’s not particularly large, nor is it consistently responsive. Worse yet, its default settings ensure that you won’t be using it while keys are being pressed, proving an impossible hindrance in first-person games, such as Far Cry Primal. In short, bring along a gaming mouse. In classic gaming laptop fashion, the trackpad on the Dell Inspiron 15 Gaming assumes that you’re always going to have a mouse in-hand, though that isn’t necessarily true for everyone. Fortunately, the port selection is less presumptuous. Veteran gamers and newcomers alike will appreciate the inclusion of three traditional USB 3.1 ports in addition to a solo Thunderbolt 3 USB-C port. You can also expect HDMI, an SD card reader that doubles as an MMC slot, standard ethernet and a headphone jack. On the downside, the speakers on the Dell Inspiron 15 Gaming are quite literally on the underside of the machine, making for questionable sound quality unless you have it hooked up to an external audio source. Sure, you can bring along headphones, but audio shouldn’t be this much of a problem for a 15-inch laptop.